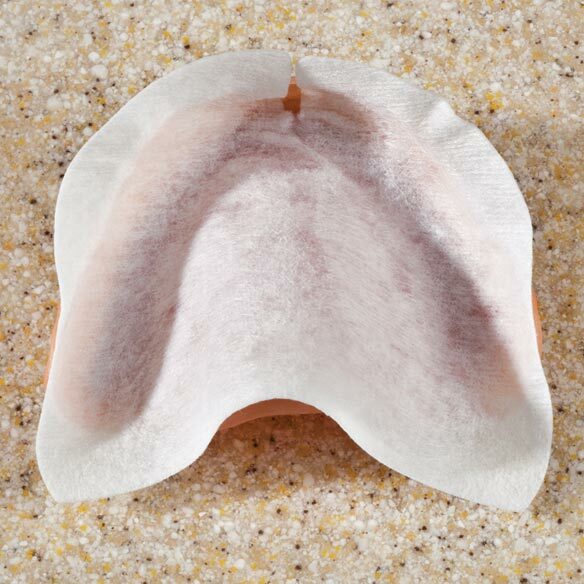 Adhesive denture cushions are a neat, easy way to secure dentures comfortably in place. Simply dip thin, soft cushion in warm water, position on clean and moistened denture, peel off backing and place dentures in as usual. No more oozing gel messes. 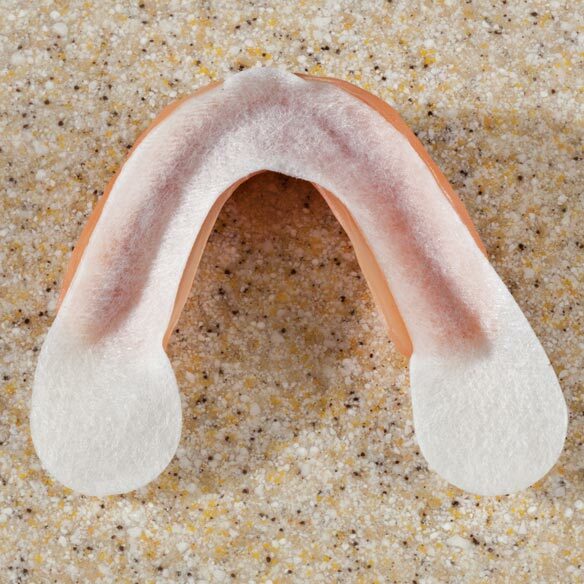 Snug denture cushions help prevent mouth discomfort. Helps keep dentures in top condition. Specify style: upper or lower. 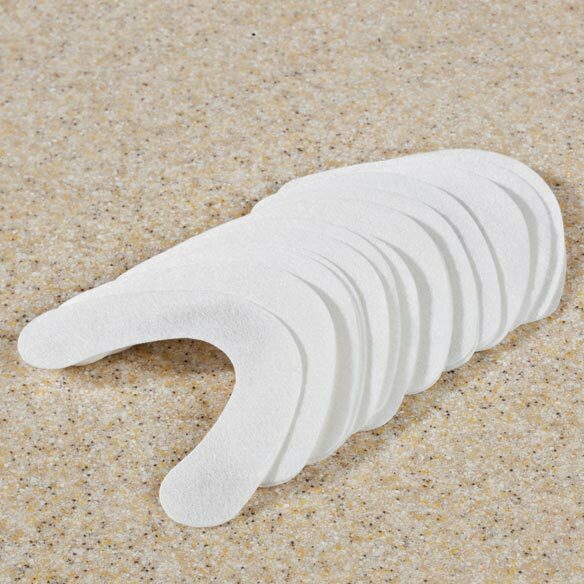 Includes 30 one-time-use denture pads. Third time purchasing this product. Have only used the upper adhesive. Easy to use. Holds denture all day.Like so much better than store brand.So simple to use. Cut off about half an inch at bottom,wet both sides,place in denture,then trim off any of wafer hanging over denture. It was for my mother who is 86 years old. She didn't think they were thick enough however I may try on my own dentures and let you know my opinion of this product. Thank you for your review. We are sorry to hear the denture cushions were received defective. Please contact our customer service by email at easycomfortscsr@silverstarbrands.com or by phone at 1-800-296-5174 and we can assist you further. We apologize for any inconvenience this may have caused. Works better than the other brands. Hopefully more effective than denture paste. Just want to try them. For easy usage for my husband. My upper plate needs relining. Until wanted to try this instead of the adhesive creams. First time purchasing liners. They looked liked they would work well and at a good price. To help my dentures more comfortable. Looks easier & more comfortable than adhesives for my husband. Have tried paste type denture aid. Hoping this will keep them in place. Have had recommendations for this. My disabled mother has very hard time removing gel adhesive made for dentures so hopefully this with be more convenient. I am having a little trouble getting used to my new. Never used them but hope they work as dentures are too loose from losing weight. My husband has been looking for this everywhere. Rah found at last! Never saw these before and thought they would help. I chose this product because it works well for all day comfort as well as not having the ooze of glue that I experienced with tube denture glue product. Because I don't the the gooey mess of the denture creams..I'm hoping that these will pervent that problem. Dad can't keep lower denture in. Hopefully this will work. I wanted to see if they work, as ones I have purchased have not. I am hoping yours do. Hope it works; can't stand other stuff. HUSBANDS NEEDS THEM ,WANTS TO GET AWAY FROM THE CREAM. My husband likes these better than any others he has tried. Are these easy to remove? How do you know what side goes on the denture? BEST ANSWER: One side is gauze-like and the other is shiny and is the side with the glue on it. Once you see if, you will know which one goes up, down, on the gums. Let them sit undisturbed for about 5 minutes or so after placing them in your mouth. 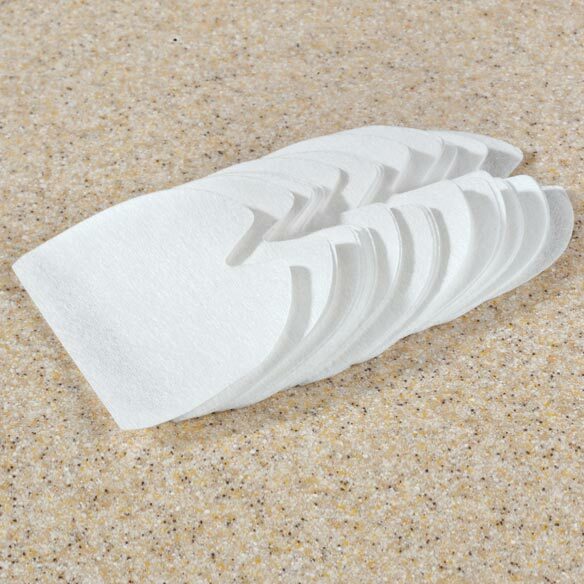 You will have trimmed these to fit your dentures and should be close to the size of your plate. I let them sit for a couple of minutes before putting them into place and they have had a chance to adhere a bit. I watch what I eat when wearing these as they can be disturbed with chewing some things. I like them better than the goop that you can just put in between your plate and your gums. When you moisten the cushion you can feel the side that sticks to you and apply accordingly. Why does it say to peel off the back? Very thin soft would remind you of a single layer of felt. Does not retain odor and works well. No lower ridge. Ancient surgery removed freenum muscle to "create non existant ridge. My 3 yr. old set of rplacement dentures work well and I can eat everything. but my bottom dentures appear not there. I am 74 yrs. young. How can I cosmetically elevate my lower denture. Would cushions ? on cushion heighten and show bottom dentures, advice ideas, thank you. The instructions with the pads do not say anything about peeling away one side and then I have seen that some people do express this. Can you help me with the correct instructions? Iam trying to order denture liners and cannot get passed the select a style which i did? BEST ANSWER: Thank you for your question. You can select upper or lower then click add to cart. We hope this information will be of help to you. DO YOU HAVE TO ADD EVERYDAY? BEST ANSWER: Thank you for your question. Yes, each pad is one-time use only. We hope this information will be of help to you.